Are you girls obsessed with princesses? Most are…including mine. 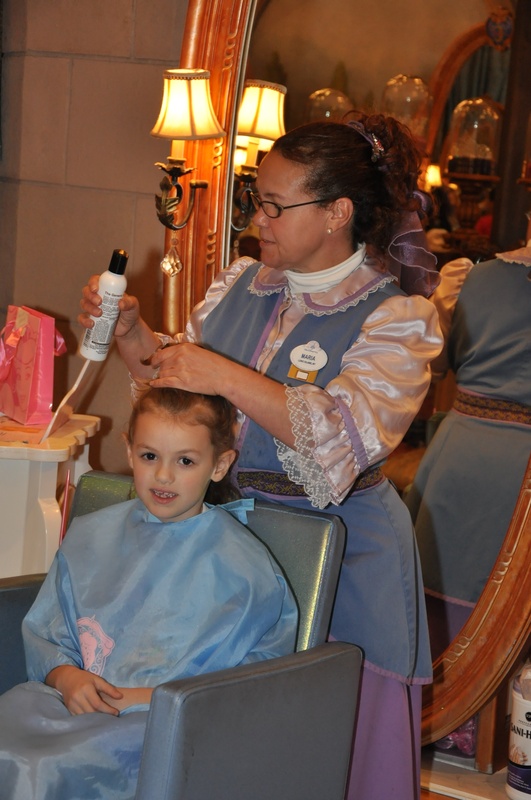 A special experience your kids (yes, the boys too) can have while you are visiting Walt Disney World is an appointment at the Bibbidi Bobbidi Boutique. There are 2 locations, inside Cinderella’s Castle in Magic Kingdom & in The World of Disney store at Downtown Disney. We did BBB on our last trip as a Christmas present for the girls. They loved the experience. 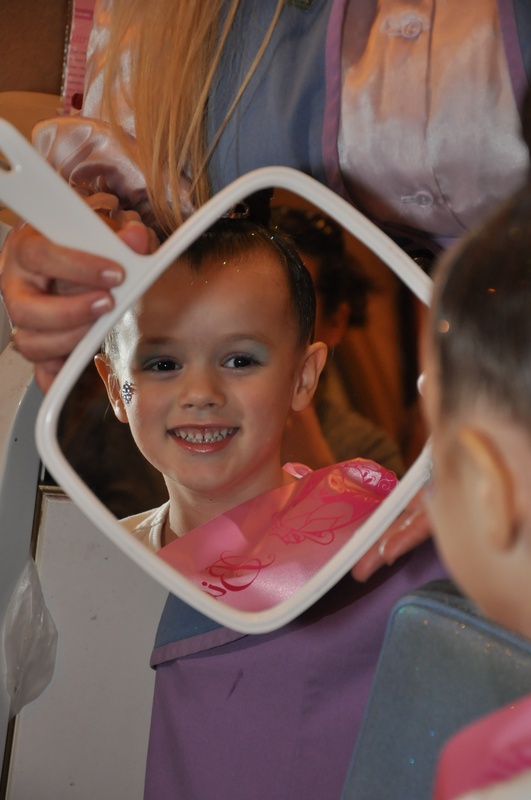 You would have thought every little girl was an angel sitting perfectly still with a smile on their face in that salon! The women in the salon are called Fairy Godmothers in Training. They work on their hair, makeup & nails at the same time. They don’t let them see what is happening until the reveal a the end. 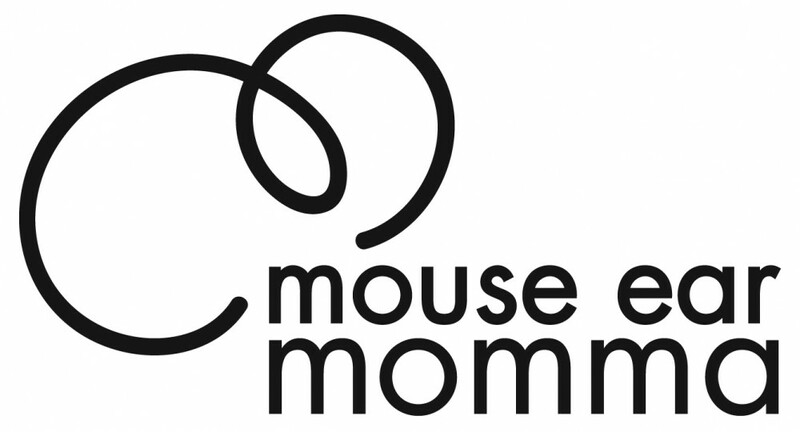 There is a photopass photographer taking your child’s picture throughout the process. These pictures were way better than any of the ones we took with our camera. The reveal pictures were my favorite! Overall, it was a great experience and I would do it again. My 7-year-old kept her hair style in for 3 days of the trip, she slept with it twice and it still looked great! My 4-year-old wanted it out within 4 hours. You just need to judge your child and decide how much they would like the experience, not how much you would like to see it! We brought our own dress ups, so we just did the Coach package and I had preordered the Photopass CD. There are 3 different hairstyles to choose: Fairytale Princess (this is the one my girls chose), Disney Diva & Pop Princess (both include hair extensions). Children must be between 3-12 years old. My nieces stopped in (the entourage) and the Fairy Godmothers in training gave them face gems and hair glitter too. UPDATE: They are now offering a Sofia the First package for younger girls. 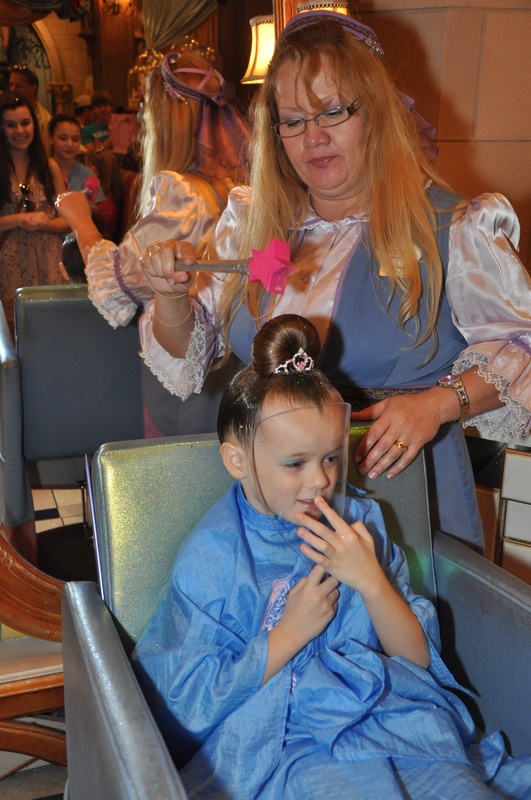 It includes Sofia’s hairstyle, shimmering makeup, nail polish and a crown and purple hair bow. Here is the brochure for the Knight package for boys, the styling includes hair color and style along with the props. This is worth $15.95 if you have a son who doesn’t want to sit around and wait for your daughter! If you are interested for your trip, call (407) 939-7895. This does book up quickly in Magic Kingdom, so book early (up to 180 days in advance)! For the Castle, you do need park admission to get into Magic Kingdom first. The BBB in Downtown is not nearly as busy as in Magic Kingdom, so if this is an experience you want check there as well. This entry was posted in Fun Disney Stuff, General, Uncategorized and tagged bibbidi, bobbidi, boutique, boy, castle, cinderella castle, coach, costume, crown, diva, downtown disney, dress up, fairytale, hair, hairstyle, knight, make up, makeover, makeup, nails, package, photographer, photopass, pop princess, prince, princess, salon, sofia the first, world of disney by Mouse Ear Momma. Bookmark the permalink. 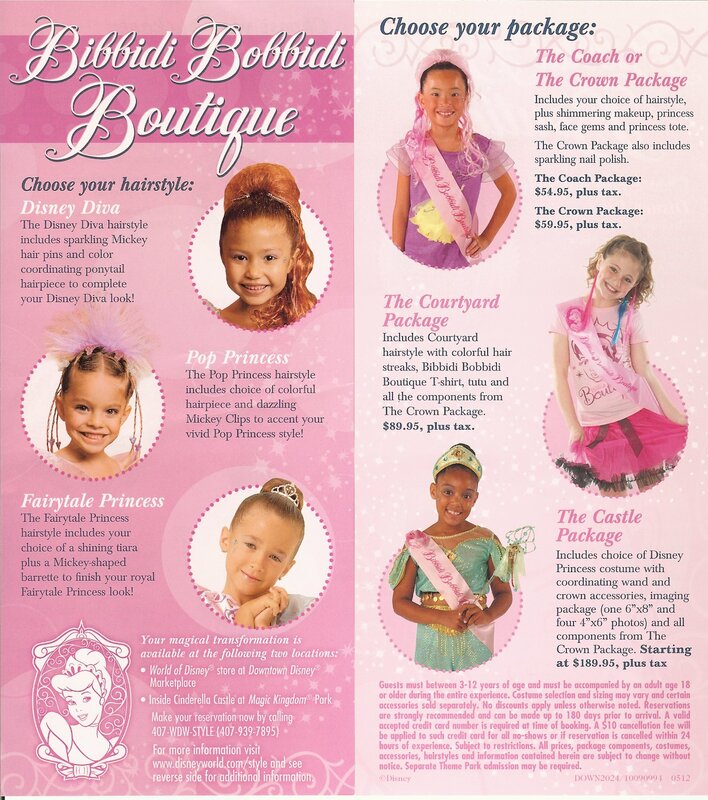 Updated September 30, 2012 with the current brochure from Bibbidi Bobbidi Boutique!